The band from Würzburg is active for 5 years now and in 2007 they released an EP called Mutilated Corps on their own. Now their debut album Chronicles Of Betrayal is getting in stores thanks to MDD Records. The band recorded the album with Andy Classen at Stage One Studios. Voice Of Revenge play old-school melodic death metal und are into the Swedish variety. The tracks are varying, well arranged, offer melodic solos and the dual leads - and all this is Voice Of Revenge. You'll find similarities to old In Flames and Dark Tranquillity in their sound. They are not just melodic, they are heavy, too. And quite a few times they push down the accelerator and once in awhile they storm off into a blast beat attack. When they speed up you'll find reminiscences to Unleashed, but also a dash of black metal in their mix. Voice Of Revenge deliver a decent debut, especially the guitars can shine, but everybody seems to be heart and soul about their music. But they have to find their own sound, coz right now they sound like many other newcomers and they don't stick out. The guys have the potential and hopefully next time they can show a bit more uniqueness... 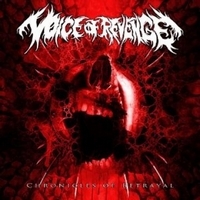 Fans of melodic death metal should check out Voice Of Revenge!